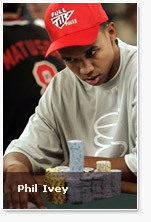 So when we last left you, the principals in this story (Phil Ivey, Ram Vaswani, Marc Goodwin) had assembled in Monte Carlo to try and resolve the dispute. Barry Greenstein had agreed to try and be a mediator in the dispute. However, nothing was settled, with Marc Goodwin even inferring that Greenstein was biased and should not be acting as an arbitrator. As you also know, Daniel Negreanu made a now famous blog posting in which he sided with Ivey, pointedly asking how Vaswani and Goodwin could not be paying their debts immediately to Ivey. Well, this angered Barney Boatman, a close friend of Ram Vaswani, and Boatman issued a public statement saying that Vaswani was a man of honor, and there must be a reason for Vaswani not honoring the debt. Boatman implied that Vaswani must have been cheated for this situation to go down the way it did. The situation is close to being resolved however; an independant arbitrator has been hired, and both sides will be presenting their case to the arbitrator while in Las Vegas for the Bellagio WPT Championship. Both sides have agreed to go along with whatever the arbitrator proposes. We will keep you posted as soon as we hear about the decision that is rendered.